Dreadlords are defined in chapter 22 as "darkfriends who [can] channel" (202). Also, one of Egwene's fears she had to face in the silver arch ter'angreal was to refuse Rand a quick death, instead of allowing the Dreadlords and Myrddraal to turn him to the Shadow. It takes thirteen Dreadlords weaving flows through thirteen Myrddraal to turn a channeler to the Shadow. Sheriam Sedai explains that because Aes Sedai "learn to open [themselves] to the True Sources means that [they] can be--opened to other things" (202). This forced turning to the Shadow has not been used yet in the storyline, and I'm sure we're going to see more of it in book 12. Also, we have not yet seen the revelation of new Dreadlords. 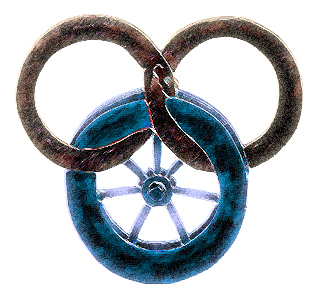 This is probably another marker for Tarmon Gai'don and we will probably see this in book 12 as well. Who might the new Dreadlords be? You said we haven't yet seen any new dreadlords. What about TAIM and the ASA men that turn on Rand in book 8. Do you think they are Darkfriends that can channel or another faction all together. That's a good point. I'm not sure. I think Taim is mad. He was channeling the One Power a lot longer than Rand and we know how batty Rand has gotten. I don't think Taim takes orders well, and sitting in the number two spot never appealed to him. Like all nuts he has followers in the Black Tower. On the otherhand, Taim would make a perfect Dreadlord. I can't remember if Liandrin is still alive. If she is, she'd be a perfect Dreadlord too.